Gasuta Lodge is a unique, romantic getaway situated in the Kamberg area between Nottingham Road and Himeville in the beautiful KwaZulu-Natal Midlands. The Lodge can be found in the heart of the Stey Braes Classic Game & Cattle Ranch, a working stud farm renowned for breeding quality Brahman, Limousin and Hereford cattle. 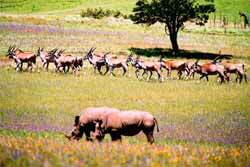 Game, including a breeding pair of White Rhino and many species of antelope, have been introduced to a large section of the ranch. 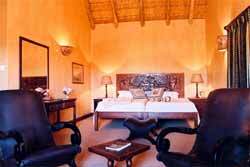 The Lodge has only two luxury suites on offer. Should one be booked, the second remains unavailable to the public for the duration of your stay. 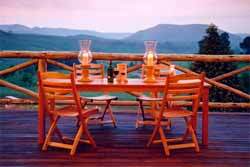 This means that you have the entire Lodge to yourselves, thus enjoying complete privacy and tranquility. 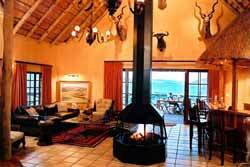 Gasuta Lodge has been awarded five star grading by the South African Tourism Grading Council. It has also been rated Superior bythe AA Quality Assured. As Gasuta Lodge is a small, privately owned establishment, we can afford you, our guests, enormous flexibility during your stay with us. There are no fixed times for meals or activities - the day is planned to suit you, no matter how you choose to spend your time. The Lodge consists of two luxury suites, each with its own satellite television, bar fridge facility and cosy sitting area. A dressing room adjoins each bathroom, which contains a shower and spa bath. The entire Lodge boasts under-floor heating, which will ensure you remain cosy and comfortable, no matter how frosty the weather outside. An evening in the underground wine cellar would be a highlight - enjoy the wide selection of South African estate wines, many of which are no longer commercially available as they emanate from a private collection. Sundowners in the gazebo overhanging the large water feature, or a picnic on the banks of the Mooi River, can also be arranged - nothing is too much trouble!